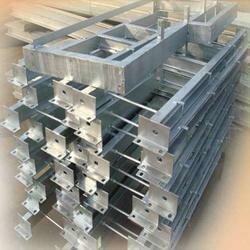 Our product range includes a wide range of galvanized steel structures. We "SKMK STEELS LLP" are a prominent nemae in providing Galvanized Steel Structure. Moreover, We provide erection of structural steel, miscellaneous iron and structural and architectural precast. In addition, these include installation of structural steel, metal deck, stairways and miscellaneous metals. The other important feature of steel framing is its flexibility. It can bend without cracking, which is another great advantage, as a steel building can flex when it is pushed to one side by say, wind, or an earthquake. The third characteristic of steel is its plasticity or ductility. This means that when subjected to great force, it will not suddenly crack like glass, but slowly bend out of shape. This property allows steel buildings to bend out of shape, or deform, thus giving warning to inhabitants to escape. Failure in steel frames is not sudden - a steel structure rarely collapses. Steel in most cases performs far better in earthquake than most other materials because of these properties. WEIGHT OF STEEL FRAME STRUCTURESConsider a single storey building measuring 5 x 8m (16 x 26ft). Let us first construct this in concrete, with four columns at the corners, beams spanning between the columns, and a 150mm (6") thick concrete slab at the top. Such a structure would weigh about 800 kg/m2, or 32 Tons (32,000 kg) in total. If we build this of steel instead, with a sloping roof covered with corrugated metal sheeting with insulation, this would weigh only about 65 kg/m2. The steel framed building will weigh only 2.6 Tons (2,600 kg). So the concrete building is over 12 times heavier! This is for single storey structures - in multi-storey structures, the difference will be less, as the floors in multi-storey steel buildings are built of concrete slabs for economy - but the difference is still significant. This low weight of steel frame buildings means that they have to be firmly bolted to thefoundations to resist wind forces, else they could be blown away like deck umbrellas! Looking for Galvanized Products ?